The hard working honey bee is under threat and needs your help. In the UK the honey bee population has decreased by 30% in recent years, which has significant implications for agricultural industry as they alone pollinate over a third of the UK’s food crop. In fact these little creatures are so amazing that the global food chain relies so heavily on bees that it is estimated by MPs that a collapse of the Honey Bee population could cost the UK £200 million. The British Beekeepers Association estimates that another £8m of Government funding is needed to finance a research programme to help improve bee health. 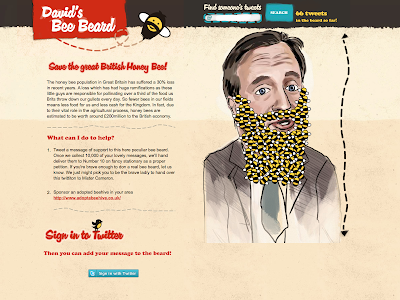 With these incredible statistics in mind digital agency LBi has devised a fun way to draw the prime minister's attention to the declining UK honey bee population by giving him a virtual "bee beard" that doubles as an online petition. Cameronsbeebeard.com, has been designed to gather signatures for the petition via Twitter. Everytime someone tweets a message of support an animated bee joins the swarm. The idea is that once the Once the site collects 10,000 messages, LBi will present the petition to 10 Downing Street. Share this with your friends as it's time to create some real viral buzz!